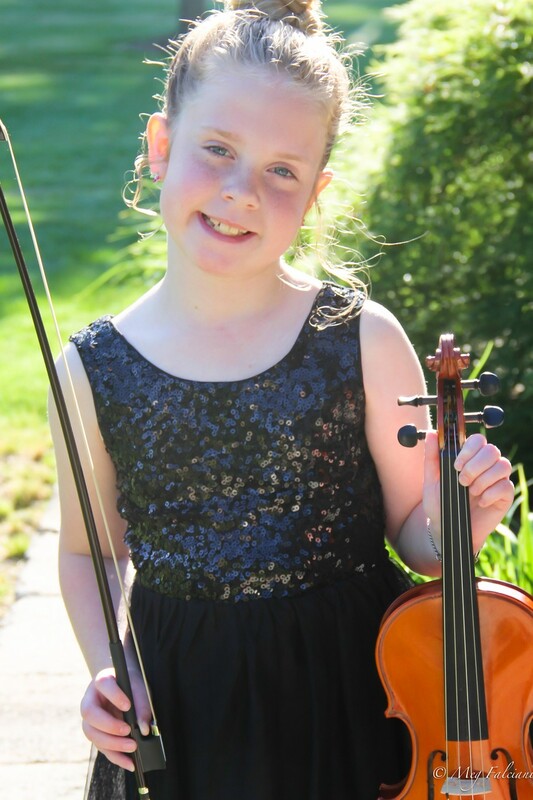 When Celia was in first grade, she saw others at school taking music lessons and wanted to play the violin, but had to wait a year to reach the instructor's minimum age requirement. She was devastated when she got to second grade and was told the minimum age for music lessons was no longer second grade but third. She petitioned the principal (begged tearfully, really), and the decision was reversed. She took lessons at school through second and third grades, and wanted to take summer lessons this year, but it just wasn't going to work with our schedule. 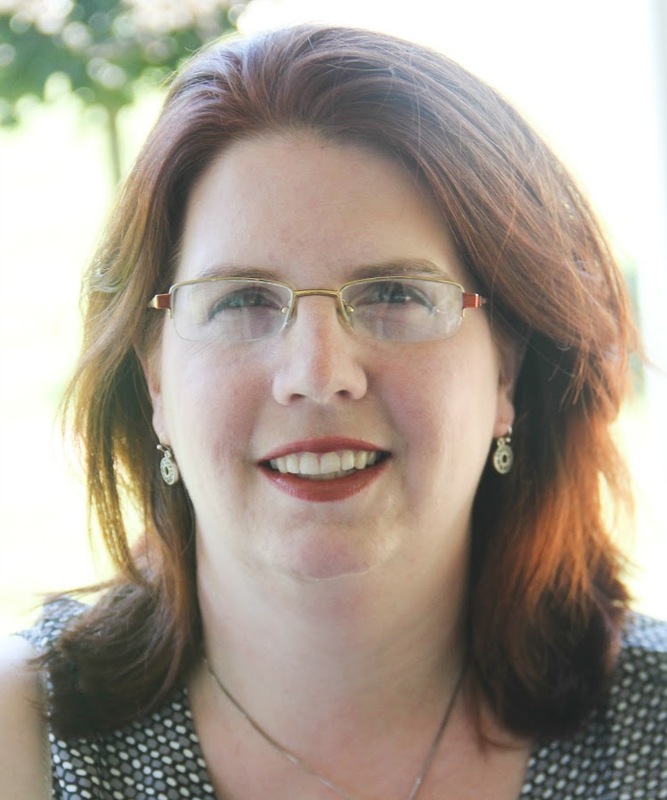 When the opportunity to take lessons with MacPhail Center for Music's Online Program arose, she couldn't wait. I asked her if she wanted to take them, and she was ready to run for her violin and take a lesson at 10 o'clock at night. So MacPhail easily had a student - now Celia just needed a teacher. Celia is one of my "regular" school kids. Her school started out as a Catholic parish school, and merged with another parish school to become a Diocesan regional school. That school was closed by the Diocese, and the parental school board regrouped and reopened as an independent Christian academy. Her third grade teacher, Mrs M., has been teaching there through all of this - in fact, she was already teaching in the original parish school when my husband was a student, and he graduated from 8th grade in 1990. Let's face it - one does not teach in the Catholic school system for over 25 years with aspirations of becoming rich. It's because the teacher truly loves her students and teaching. I admit this means we are spoiled and have high expectations for teachers, because we know there are great ones out there! After looking at the professional credentials of MacPhail's staff, I knew we were going to be matched with a great musician. I still was concerned - how good a teacher would that musician be? First, Celia and I had a technical meeting with Kristin Shoemaker, DMA, who is MacPhail's online coordinator. Kristin was incredibly kind - it was our first ever experience with Skype, and she talked us through how to get the video feed working. After that, she asked us some questions about our internet connection and speed, and then wanted to test out our microphone and speakers. She patiently listened to an impromptu violin recital, and had a conversation with a very, very excited violinist. Her demeanor gave me confidence we were going to get a great teacher. She spoke very highly of the teachers at MacPhail, and also told me that her own daughter w as a student there - and a happy student. After we concluded our technical meeting, Celia sighed, "She was so nice, Mommy," and we waited for an instructor to be assigned. Karl Wiederwohl, DMA made the teacher assignments, based on a questionnaire I filled out that helped him assess Celia's current level. While Mr. Wiederwohl is a brass instructor, he also serves as MacPhail's placement assistant. He was very prompt in answering questions, and provided me not only with our instructor's name, but also his credentials. Celia was assigned to Jeremy Swider. Mr. Swider holds a Bachelor of Music degree in applied violin and music composition from the University of Houston, and a Master of Music degree in violin performance from the University of Minnesota, where he also distinguished himself as a concertmaster. (A orchestral concertmaster is the second-in-command behind the conductor - in other words, he's Good with a capital G.) He is currently a violinist with the Sonorous Strings quartet and serves as their musical arranger, and has played in at least two symphonic orchestras. In addition to the degrees he holds, the biography listed some of Mr. Swider's instructors. Now, I hold a degree in theater from Temple University; I trained under some well-known teachers and alongside some now-prominent actors. It takes a lot for credentials to impress me. However, his biography indicates Mr. Swider also studied with the reknowned maestro Andrzej Grabiec. I admit, having a concentration in Musical Theater means I know more about Steven Schwartz and Andrew Lloyd Webber than Strauss and Wagner, but I do recognize Maestro Grabiec's name, and know that he is legendary. I am dutifully impressed with Mr. Swider's credentials. Jeremy Swider has been teaching violin and viola at MacPhail for the past 11 years. He enjoys teaching all ages, from 6 to adult. Other positions he holds at MacPhail include: teaching at a partnership at Ascension School in North Minneapolis through the Early Childhood Music Program; serving as Chamber Music Coordinator and Adult Chamber Music Camps Coordinator. From classical to pop, improvisation and fiddle techniques, Jeremy’s teaching style incorporates a fun, well-balanced mixture of traditional technical materials and exciting musical repertoire to help students quickly gain more confidence in performance or audition situations. He also likes to help students develop their artistry by learning to listen carefully to themselves and form their own musical aesthetics. I know it seems like I'm focusing right now on the Celia's teacher, and less on the program. However, I really want my readers to understand that no matter how good a musician someone is, if he can't teach well, it doesn't matter. A bad teacher can turn a child off from music entirely. Celia loves to play the violin. 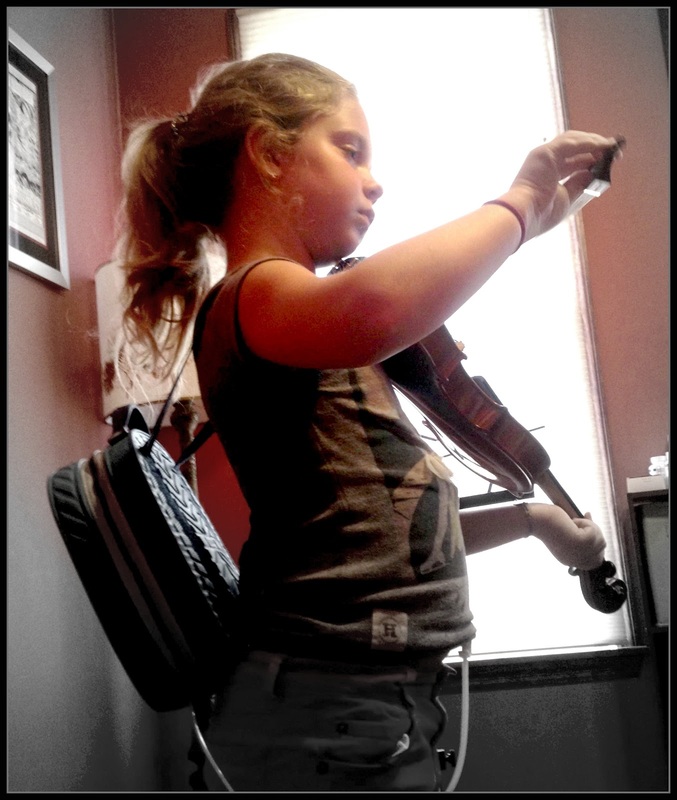 At the end of her first year of instruction, she begged us to buy her violin outright from the rental company - she didn't ever want to give it back and wanted to take lessons forever. She even said if we paid for it in June, she wouldn't ask for anything else all year, including her birthday or Christmas. I think we all have a bit of "Mama Bear" in us when it comes to our children, but Celia has some major medical issues that make being an average child impossible. I don't know that she's the next Itzhak Perlman, but she likes playing and has a good ear. She's had so much taken from her because of her medical issues, that I refuse to let anyone steal her joy of music as well. I thought Celia was going to explode before she even got to her first lesson. If she was anxious before our technical videoconference, she was downright antsy between when that ended and her first lesson. She spent the final ten minutes between setting up the computer and her first lesson hopping up and down, asking "Are you sure the volume is on? We'll know when Mr. Swider calls, right?" Finally, the alert tone buzzed and our first lesson began. In the first ten minutes, I knew Mr. Swider was a Teacher. He was wonderfully patient with Celia and all her excitement, allowing her to show off what she knew, and complimenting her on her Spring Recital piece. He asked her if she knew any music theory, and when she said she did not, he patiently began explaining things to her. He did not get upset when she started saying, "Oh, right - I knew that!" Celia has music theory classes in school, but they're not called that. She's just learning "music." After her lesson, I emailed Mr. Swider to say that she knows more than she thinks she does, and gave him a brief overview of what had been taught before. 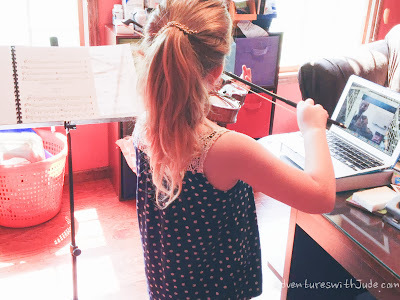 She hadn't made the connection that even though she didn't learn quarter notes and the staff in violin lessons, she already knew them from her regular class from Mrs. J. When we spoke, I compared it to knowing the alphabet, but not realizing letters make words. In the past five weeks, Celia has not only begun to make words, she's made sentences! Paragraphs, even! Celia's first lesson was really a "get to know you and what you know" session. By lesson two, she had moved on to open strings and preparing for holding strings, and by week three, she was learning how to work the fingerboard. She was thrilled that she could now do more than just play "Open Strings." After each lesson, we got an email with that week's homework attached. 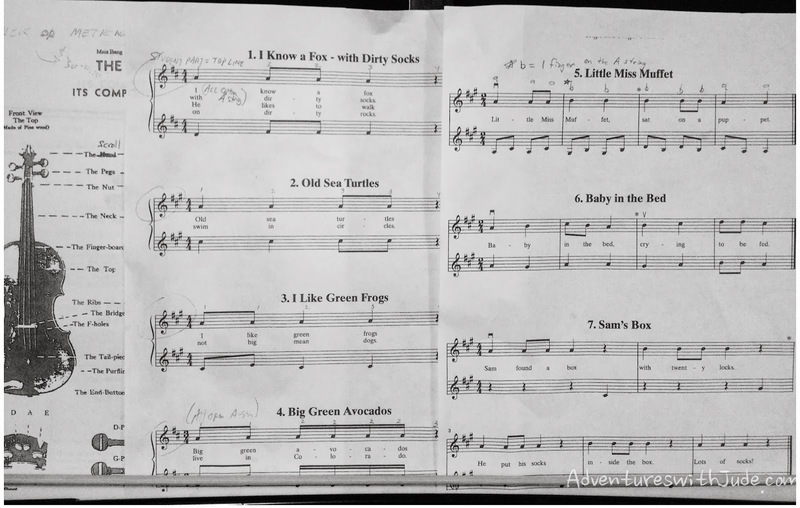 The first week had a practice book and an extra sheet of music exercise songs, but in Week 2 she started playing simple 2-note combination songs. By Week 3 she had moved on to exercises to work on finger placement. 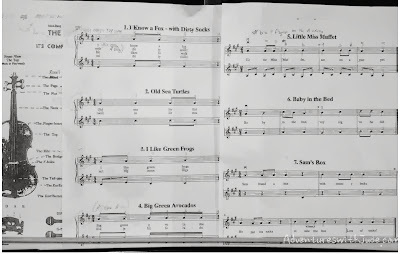 Week 4's homework was three actual songs - "Hot Cross Buns," "Clair de Lune," and "Mary Had a Little Lamb." I thought she was going to bounce right into the computer screen when she was taught them. Before, getting her to practice had been tough. I think she really was bored -- due to the parameters of her school lessons, she would be working on the same piece of music for several weeks. She has so much that she's learning that she's eager to practice and show off. Her confidence in her ability has grown. At the close of her third lesson, Mr. Swider said if she practiced the one-finger-on-the-string notes, he felt she would be ready to learn two-finger notes the following week. Unfortunately (or fortunately!) she was ill for several days, so she wasn't focusing on this "definite maybe," and her practices once she was better focused on the music sent to us after the last lesson. When she realized that today was the day, she got nervous and even said, "I don't know if I'm ready." Mr. Swider's response was, "Sure you are! Give it a try!" and next thing she knew, she was playing three-note songs. He also gave her an exercise to study, and at first look she was completely overwhelmed. He quickly broke it down and showed her - it was a set pattern, played on successive strings. It didn't seem quite as intimidating then, and she was playing it fairly well (in my opinion) by dinnertime. (She's not ready for Carnegie Hall, but it sounds pretty good for only three hours later!) I truly believe her zeal and success is because her teacher is excited about teaching, gives praise when appropriate, and constructive criticism is kindly delivered. I would wholeheartedly recommend this program. I can only imagine that the other instructors are of an equal caliber. Lessons are a half hour long, and there isn't a minute that isn't being used. We're still working on finding a good tuning app, so usually the beginning of the lesson is fine-tuning her violin. She's getting better at being able to do it herself. The first lesson I sat in the corner of the room with her to help, but now she only needs me if a peg needs to be turned (she doesn't have the dexterity to turn it and push it into the top...excuse me, the scroll...tightly). She is enjoying the lessons so much that we have decided to sign up for lessons on our own. She is very disappointed that there are two weeks between now and her next lesson when the Fall Semester begins. I really hope that she gets new things to work on at that meeting- we're already about to change the title "Clair de Lune" to "Declared Looney." All joking aside, it is a real blessing to see her so excited and engaged in her lessons. First is a special Introductory Pricing Package. You receive Four Online Individual instruction lessons for $111. These are four 30-minute individual online lessons, from an outstanding teaching artist, from the convenience of your home. All K–12 homeschool students are eligible to participate in this package, and it is a 25% discount from standard tuition rates. Second is a Daytime Flex Pack option. Each package consists 8 online lessons during the 18 week semester, taken on any weekday from 9 am – 3 pm CST. (This is important to note. MacPhail Center for Music is located in Minneapolis, MN, and in the Central Time Zone. Check your clock if you are in another time zone.) If you have something come up and you just can't make the lesson as scheduled, you can cancel up to 48-hours in advance, without forfeiting the lesson. 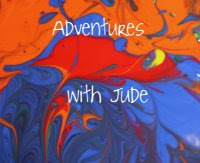 Standard pricing will apply after introductory lessons at $37 per 30-minute lesson. This program was so much more than I expected. I had hoped for Celia to be able to keep up with her music skills over the summer, and she's racing ahead. We never had to leave the house to go to a lesson - and her 1 pm EDT lesson didn't even mess with naptime - Damien laid down for a rest just before the lessons began so that he wasn't underfoot. I hoped we would get a good teacher, and we got not just a great teacher, but a phenomenal teacher. I can't stress enough how important that part is. Celia has thoroughly enjoyed her summer lessons and can hardly wait until the Fall Semester begins after Labor Day. UPDATE 9/4/13 - We've had our first lesson and are just as happy as before. Plus, we found a new violin tuner -- that actually seems to work -- so she got a full lesson of instruction rather than half a lesson in tuning. UPDATE May 2015 - It's now been two years since we started taking lessons with MacPhail's Online program. They've now added a V-Recital to the program - a virtual recital so online students have an end-of-year exhibition. Come see how far Celia has come, as well as see other Online students perform. Crew students took lessons in many instruments with many teachers. 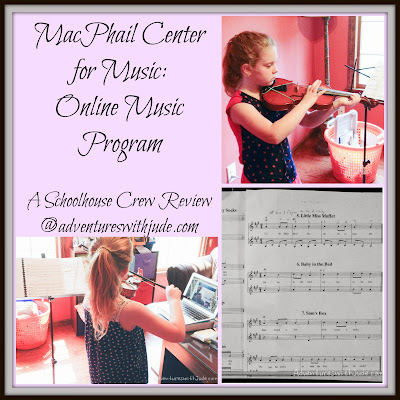 Click to read about their experience with MacPhail Center for Music. Want to keep up with all of our Crew reviews? I love this review. It makes me so happy for your girl! We purchased an electronic tuner from the music store we found that the easiest way to tune the violin till he mastered the pitch fork. THANK YOU!! We will give them a try! I can hear it's off, but I can't tell HOW off. I've a presentation next week, and I'm at the search for such info. 2 years in the future in 1997, ICOS performs its initially review in people with impotency problems by 1998, a relationship among Lilly and ICOS is created. wil break in any other case handled with pride. For the money i paid it is still an effective set. make certain to don?t put out of your mind this site annd give iit a look regularly.